Mass Shooting In Tel Aviv Leaves 4 Dead, Several Wounded : The Two-Way Israeli police say two gunmen who shot shoppers at a popular open-air market were apprehended. Both are Palestinian men in their 20s. 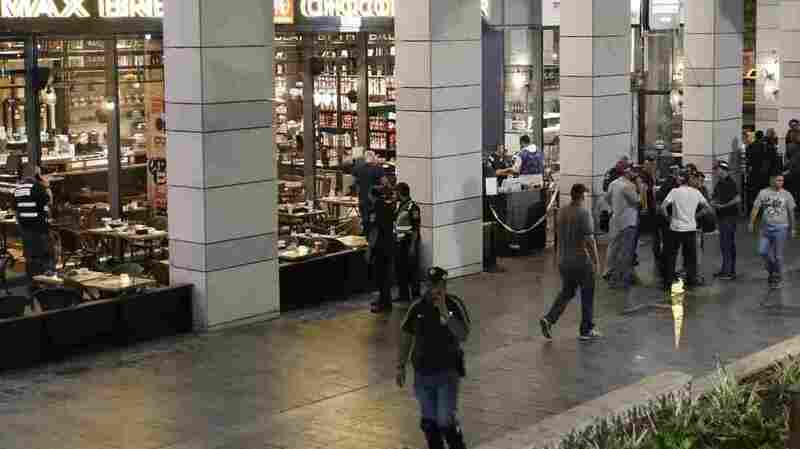 Israeli security forces gather at a shopping complex in Tel Aviv following a shooting attack in a market and restaurant district on Wednesday. Two gunmen opened fire in a central Tel Aviv food and retail center, killing four people Wednesday evening in what Israeli police say was a terrorist attack. An Israeli policewoman (right) interviews a witness about the shooting attack at a shopping complex in Tel Aviv. NPR's Emily Harris reports that Israeli medical authorities say that another four people were wounded. Local police tell Emily that two men were apprehended in the attack. Both are Palestinians in their 20s. They are cousins, according to the police, and from the same town near Hebron in the West Bank. One of the suspected gunmen was injured and is now in the hospital, according to Haaretz. It reports that the two armed men began shooting passersby in two separate locations near the Sarona market before being intercepted. There are no details yet on the victims. The wounded were evacuated to local hospitals. Meital Sassi told Channel 10 TV she was out with her family celebrating her son's birthday at the Sarona market when she heard shots and "immediately understood it was a terror attack." "We ran like lightning with the baby and the stroller," she said. "I yelled at people who didn't understand what was happening to run." Israeli Prime Minister Benjamin Netanyahu returned to Israel from a trip to Moscow soon after the shootings, which he called "cold-blooded murder." "We held a consultation about the series of offensive and defensive measures that we will implement to act against the grave phenomenon of shootings. They certainly challenge us, but we will provide an answer," Netanyahu told reporters." "In the wave of Palestinian attacks against Israelis that started last fall, most happened in the West Bank and in Jerusalem. But one American was killed in a March stabbing in Tel Aviv. Thirty Israelis have died in attacks since last fall, and over 200 Palestinians have been killed by Israeli forces — a majority, Israel says, while attempting attacks."